Celyna often boasts that she fears nothing. And why should she? By the time she was 10, she had already witnessed and survived the destruction of her village, exile in a forest, been sold into slavery, attacked, earned her freedom, and started training to be a wizard under Xiuhcoatl – the most ruthless wizard in all of Enbra. What else is there to fear? How about her worst nightmare? Celyna woke up, her ringing ears added to her disorientation. The floor seemed to be moving. Water splashed against the walls outside. Tiny streams of light seeped through between cracks in the wood. She sat up, trying to focus on her surroundings. Several other people–perhaps three or four dozen–sat cramped into the small, swaying room around her. Everyone in the room had their hands tied together. Some hurt and bleeding while others suffered only a few scratches. “Where are we?” Celyna asked. Sharp pains shot through her hands, traveling the nerves up her arms. A bolt shoved through both palms–sticking her hands together. She tried to use her teeth to untie the rope around her wrists, but every movement shot a new pain through her hands. It was no use. 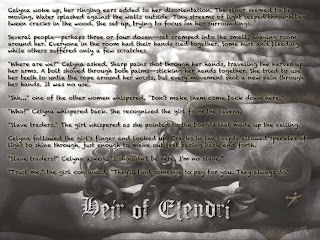 “Who?” Celyna whispered back. She recognized the girl from the tavern. “Slave traders.” The girl whispered as she pointed to the boards that made up the ceiling. Celyna followed the girl’s finger and looked up. Cracks in the boards allowed speckles of light to shine through, just enough to make out feet pacing back and forth. The small amount of light gave the room a gray and cloudy hue. Even with shaded eyes and mouths blending together in the shadows, everyone’s fear shined through. The man’s last words to her still echoed in Celyna’s head… Wizards are the easiest, once you disable their hands – they’re nothing. Celyna pondered on this for a moment and leaned her head back against the wall. She wondered if Daxon managed to escape. Celyna’s hands hurt and her body ached from being cramped. She wondered where they were, and where they were headed. She started thinking about everything that happened up until that moment – everything she had survived. Her thoughts settled on the instructions Xiuhcoatl had given her the year before: …unless you’re prepared to fight for your life. And if it does come to that, you must make sure you succeed. She snapped her attention back at the girl. Like many others in the small cabin, the girl whimpered. Celyna resolved herself to survive whatever came. They stayed cramped for so long Celyna lost track of time.The cracks in the ceiling made for poor tracking of the sun. Every few days, someone would open the door and toss bits of food and water at the prisoners. Celyna drifted in and out of consciousness. The stench of death and filth smothered the air. Some prisoners died of starvation, allowing their rations to be shared by the others. Days later, the doors opened – flooding the room with a blinding light. Men came into the room, forcing everyone still alive to his or her feet and leading everyone up some stairs. The bright Sun attacked the nerves in Celyna’s eyes, turning them against her and forcing her to keep her lids shut. The people standing in front of her remained blurred by the bright light. One man walked up to her and grabbed the rope around her wrists and cut it loose. Without warning, he grabbed one end of the bolt and pulled. The metal scraped against the bones while the barbed end ripped the flesh. The pain pushed Celyna to her knees as she screamed. Another man shouted orders. His voice sounded familiar–but in Celyna’s weakened state she couldn’t concentrate or place it. He kept shouting at the other men, pointing them where to lead their prisoners as they were each led out of the dark room and into the blinding light. One stepped up behind Celyna and pulled her back to her feet by her hair, dragging her through an iron door and down some stairs back into the dark. At one point, Celyna’s ankle betrayed and twisted under her, causing her to lose her balance and fall over, rolling the rest of the way until she hit the rock floor at the end. The hiss of a whip cracking over her gave too little warning before its sting landed on her back. She screamed as she was pulled back to her feet by her hair, only to be tossed further ahead as other prisoners shuffled deeper into the cave. Celyna held her breath as her eyes refocused and she realized the dangers she and the other prisoners now faced. She was in the mines.